It is July 4th 1945 - and it is a very special celebration as the war in Europe is over - and the feeling of liberation and joy will never be forgotten. Come to Phillips Bay, a charming spot you won't find on any map. It is a place of simple joys, where life sets a gentle, easy pace. Take a leisurely stroll now along the shore, past the warm, cozy homes to the beckoning lights of town. 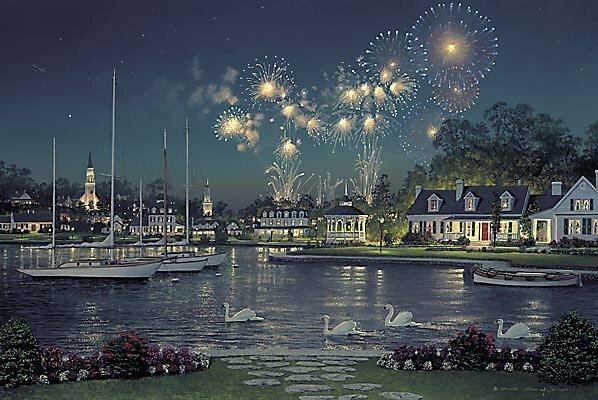 A full moon behind you casts a soft glow upon the scene, while celebratory fireworks bespangle the sky . . . . "Rejoice" reflects Bill's gratitude for a life filled with blessings, especially the opportunity to see a thrilling new era begin. Completing the original painting in the closing seconds of the old millennium, he signed "William S. 1999" just before midnight and "Phillips 2000" moments later.